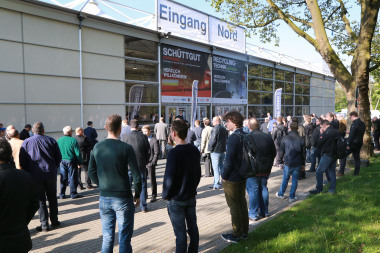 From the 7 to the 8 of November 2018 the Messe Dortmund fairgrounds will host SOLIDS Dortmund and RECYCLING-TECHNIK Dortmund at the same time. 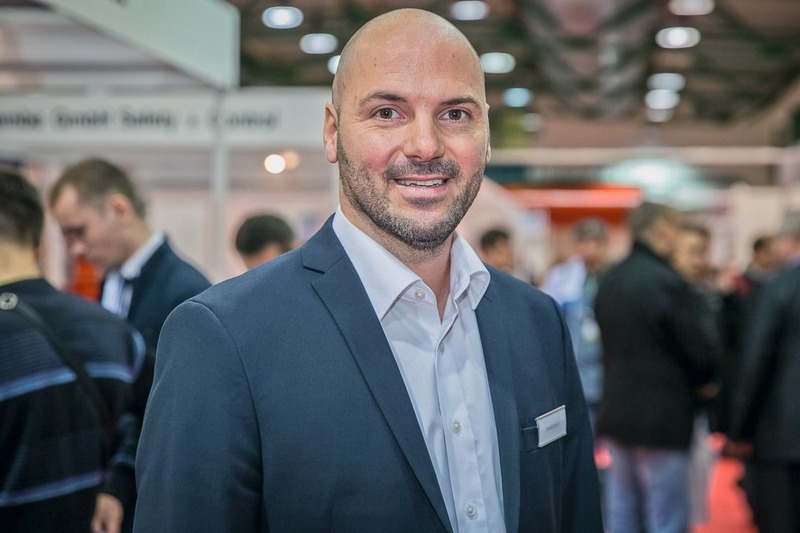 The editors of AT MINERAL PROCESSING had the opportunity to receive further information about the highlights of the two trade fairs as well as the development and planning so far from Daniel Eisele, Group Event Director of SOLIDS & RECYCLING-TECHNIK. recovery: Mr Eisele, looking back on the beginnings of SOLIDS Dortmund or of RECYCLING-TECHNIK, how has it developed over the years? Daniel Eisele: SOLIDS Dortmund began in 2006 in Duisburg in one hall with about 100 exhibitors and 1000 visitors. Since then, the number of exhibitors has increased five-fold. Since 2009 the trade show has taken place in Dortmund, with ever increasing numbers of attendees. In 2012 we launched RECYCLING-TECHNIK Dortmund, trade show for recycling technologies in parallel with SOLIDS Dortmund. Now we have over 300 suppliers of recycling technology. SOLIDS Dortmund and RECYCLING-TECHNIK complement each other very well. There are strong synergies. Both our exhibi­tors and visitors value the mixture of these two topics. 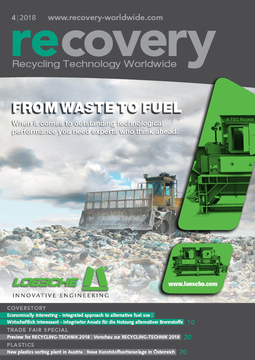 Recycling of waste needs the same kind of technology that is required in the bulk solids industry. Indeed, it is no surprise that many SOLIDS Dortmund exhibitors are now also addressing the recycling visitors with their technologies. In 2018 the event will offer more than 500 exhibitors across four halls and we anticipate more than 7000 visitors. recovery: Has the focus or the orientation shifted since the launch, and if so, in which direction? Daniel Eisele: We have a lot of exhibitors which attend the trade show from the beginning. In recent years we have had a lot of new exhibitors from the powder area. Now the exhibitor spectrum covers the whole value chain of process technologies for granules, powder and bulk material technologies and serves as an ideal platform for an exchange with suppliers for new products and solutions. recovery: Is there anything brand-new the visitors should see/test at all costs? 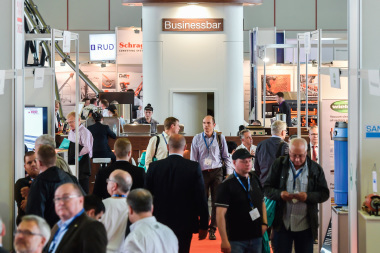 Daniel Eisele: We have new exhibitors, such as Altenburger Maschinen Jäckering, Mahltechnik Görgens, RHEWA-WAAGENFABRIK or the ZF Friedrichshafen AG, who will present their products and services at SOLIDS Dortmund. Furthermore, visitors can also meet various industry giants in the field of recycling technology, such as Bezner Anlagen- und Maschinenbau, HAAS Holzzerkleine­rungs- u. Fördertechnik GmbH, Huning Anlagenbau GmbH & Co. KG or the Lindner-Recyclingtech GmbH as well as MOCO Maschinen- und Apparatebau. 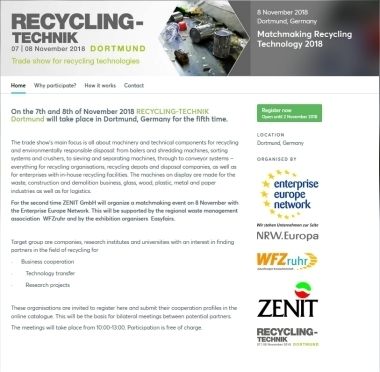 The international cooperation forum “Matchmaking Recycling Technology 2018“, which is organized in cooperation with Enterprise Europe Network, the Zenit GmbH and the WFZruhr, will take place for the second time at the joint stand of WFZruhr in Hall 7. Here, international visitors can register under: https://recycling2018.b2match.io/. Highly recommended! recovery: What are the highlights the trade shows provide for their visitors this year? Daniel Eisele: In particular, ‘red-hot‘ specialist lectures on five InnovationCenter stages and guided tours offer numerous possibilities for information and professional exchange. Important orientation is provided by the symposiums subdivided into the topics “Food“ and “Material Recycling” on November 7 as well as “Packaging Recycling” and “Commercial Waste Ordinance” on November 8. Experts from the DGAW, Fraunhofer IML, Grünen Punkt, Hochschule Ostwestfalen-Lippe, Institut für Angewandte Bauforschung Weimar gGmbH (IAB), vero e.V. and ZDS die Süßwaren-Akademie as well as from the Zentrale Stelle Verpackungsregister will inform on these topics. Furthermore, the trade shows are accompanied by the 4th German Fire and Explosion Protection Congress held by IND EX® e.V. as well as by the 8th URBAN MINING® Kongress, which will take place in parallel. A further highlight for visitors is our Networking Event “Networking on Ice“. On 7.11.2018, the bulk solids and recycling industry will meet in the Ice Sports Center Westfalen from 17 p.m., which is within walking distance, a few minutes from the exhibition halls, and provides a vibrant setting for the “Networking on Ice”. Exhibitors and visitors can take this evening as an opportunity to communicate with peers in a relaxed atmosphere and to establish new contacts. Tickets can be booked during the online-visitor registration. recovery: How is SOLIDS Dortmund embedded in the SOLIDS trade shows taking place in different places all over Europe? Daniel Eisele: Besides the top location in the Rhein-Ruhr metropolitan region, SOLIDS Dortmund is characterized by an excellent international networking: SOLIDS Dortmund is part of the SOLIDS European Series. 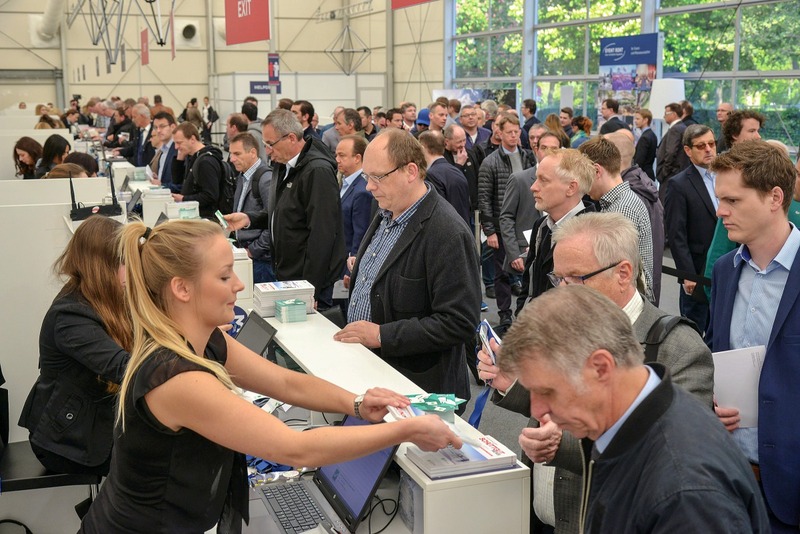 With 1100 exhibitors and 15 000 professional visitors at 6 different locations, the Solids European Series is the largest European network of trade shows for powder, bulk and granule handling technologies. In this context, SOLIDS Dortmund is the flagship and the largest trade show in the European network which also includes our bulk solids trade shows in Antwerpen, Krakow, Moscow, Rotterdam and Zurich. Each location has been carefully selected in the center of economically important metropolitan areas and in the immediate vicinity of the bulk materials plants. recovery: What are your wishes regarding the future development of these two trade shows? Daniel Eisele: The encouragement of exhibitors and visitors shows us that we are on the pulse of the time with our trade show concept. Our wish is to offer our visitors and exhibitors a unique experience with our trade shows even in future, and to enable our visitors to find the right solutions and products at the trade show. For this purpose, we will further extend the framework program and create even more opportunities for networking and creating successful business contacts.